Cards transferred to your COMC account, consigned, or purchased with COMC Store Credit are moved to your Inventory Manager where the can be priced for sale and seen by the over 1.5 million people who come to our site each year. After you have set the prices for your cards, they are immediately listed on our site, and you can update the price at any time. After logging into your COMC account, go to your Inventory Manger, the page that gives you full control over the cards in your account. This page can be found by either clicking on your username and selecting Inventory Manager. 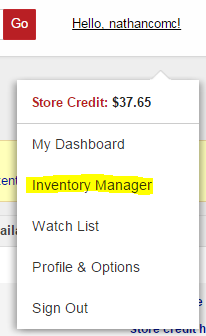 From the Inventory Manager page, you will see the items in your account. To the right of the card you will see the options to set the Asking price or the List price. The Asking price is the amount of COMC store credit you will receive in your COMC account when the card sells. The List price is the amount the card will display for sale on the site to sellers, and includes the per item shipping and handling. Either of these values can be set by typing in the amount and pressing either the enter key or the blue save disk icon. For example, we put a $1.00 asking price on this card, it would be listed for $1.25. This is what the buyer would see and pay for the card. When the cards value is saved, the focus will move to pricing the next card. This way you can quickly price through all of the cards on a given page.